The U.S. employment rose by a lower rate than many had anticipated during August: according to the latest U.S. employment report, which was published today, September 7th by the Bureau of Labor Statistics the number of non-farm employees expanded by 96,000. The main sectors that expanded during August were in Professional and business services, food services and drinking places, and Professional and technical services. The rate of unemployment edged down to 8.1%. Gold and Silver prices are hiking along with other commodities rates. The chart below presents the revised figures of the number of non-farm employees added to the labor market during recent years (up to August 2012). 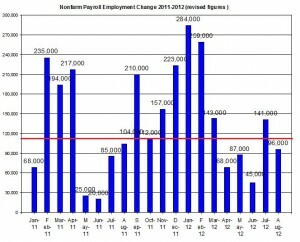 The change in non-farm payroll was revised down for June from +64k to +45k; For July it was revised from +163k to +141k. 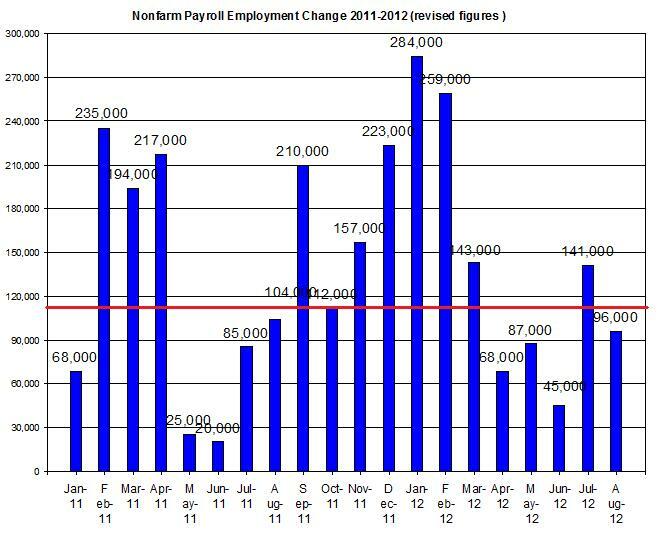 Keep in mind that the growth in non-farm payroll was very similar to the number of jobs added in August 2011. As I have calculated in the past, the number of non-farm payroll employment needed to be added to the labor market on an average monthly scale to keep up with the growth of the U.S. civilian work force is at least 107k (see red line in the chart below). This means that the recent gain in employment during August was very close to this number. Despite the lower than expected increase in employment, the rate of U.S. unemployment declined in August to 8.1%. The rate of unemployment is still at its lowest level in recent years. The current unemployment rate is nearly 1.7 percent points lower than its rate in November 2010. Furthermore, the number of unemployed persons (12.5 million) was nearly unchanged during August. Following this news currently, the Euro to US dollar exchange rate is hiking along with the GBP/USD; crude oil price is also rising along with U.S stock market indexes; gold price is also hiking. As I have already showed in the recent gold and silver prices monthly report, historically, as the non-farm payrolls expand by at least the population growth rate (roughly 107k), gold price tended to decline; this correlation was mostly due to the effect this news has had on the speculation of another QE program by the Fed. But in recent months as the chances of the Federal Reserve introducing QE3 in near future have risen due to the Fed’s recent statement of the FOMC meeting, the negative relation between bullion rates and the employment growth has changed direction in the last two reports as the expectations of another QE program subsided. The relation of the precious metals market with other markets including commodities and stocks may have prevailed in those months. But in the last few weeks the expectations for QE3 were rekindled following the recent publication of the minutes of the last FOMC meeting. This means that the relation between bullion and labor market seems to have returned to be negative as it was in recent years. 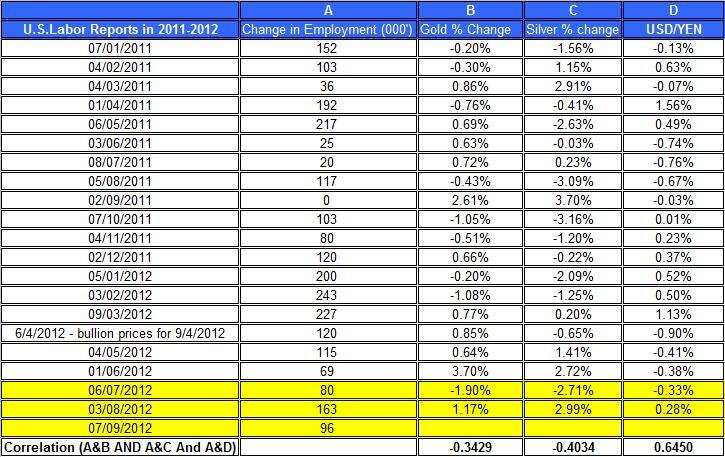 The table below shows the correlation between the news of the U.S. non-farm payroll employment developments and the daily changes in gold and silver prices on the day of the U.S. labor report publication. The table shows the negative relation between the U.S employment and daily changes of precious metals. The recent rise in the non-farm employment is lower than many had anticipated but is still near the 100k mark which is a positive sign for the recovery of the U.S. economy from the perspective of the U.S’s work force. These numbers might be a seasonal effect but if they will continue it could help with the recovery of the markets as it signals an expected rise in U.S. demand for crude oil, and consequently may continue to pressure up crude oil prices during today’s trading. thanks BOS…you are the best.all your prediction is good and acurate.